Researchers say they've found a way to let queen bees pass on immunity to a devastating disease called American foulbrood. The infectious disease is so deadly, many states and beekeeping groups recommend burning any hive that's been infected. Here, a frame from a normal hive is seen in a photo from 2017. Bees may soon get an ally in their fight against bacterial disease — one of the most serious threats the pollinators face — in the form of an edible vaccine. That's the promise held out by researchers in Finland, who say they've made the first-ever vaccine for insects, aimed at helping struggling honeybee populations. The scientists are targeting one of bees' most deadly enemies: American foulbrood, or AFB, an infectious disease that devastates hives and can spread at a calamitous rate. Often introduced by nurse bees, the disease works by bacteria feeding on larvae — and then generating more spores, to spread further. The idea of a potential new weapon to fight AFB has generated excitement in the beekeeping community, along with some skepticism about the claim of a vaccine — which remains in the testing phase. The news comes three years after the same researchers were hailed in Entomology Today as discovering the "key to bee vaccination." Scientists Dalial Freitak and Heli Salmela of the University of Helsinki say their new vaccine solves a vexing problem researchers have faced as they try to save bees from disease. Because insects' immune systems don't have antibodies, they essentially lack a "memory" for fighting diseases. Freitak says she and her colleagues were able to get around that limitation, after she realized Salmela's study of a protein called vitellogenin seemed to complement her own work, in which she found insects that were exposed to bacteria were able to impart an elevated immune response to their offspring. "When the queen bee eats something with pathogens in it, the pathogen signature molecules are bound by vitellogenin. Vitellogenin then carries these signature molecules into the queen's eggs, where they work as inducers for future immune responses." "Now we've discovered the mechanism to show that you can actually vaccinate them," Freitak said in a news release. "You can transfer a signal from one generation to another." Researcher Dr. Michael Goblirsch, of the esteemed Bee Lab at the University of Minnesota, has proposed ways to test the vaccine on large bee colonies in field conditions. "Although our immune system and that of insects/invertebrates are different, they both store information about past experience with pathogens and use this information to potentially establish resistance upon subsequent exposure," Goblirsch said. "With optimization dosage and the timing of delivery under field conditions, it is hoped that a vaccine for bees will increase a colony's ability to fight infectious disease, making them more productive and healthy. " The Finnish team calls their vaccine PrimeBEE, and they say it can be delivered to the queen via a sugar patty. 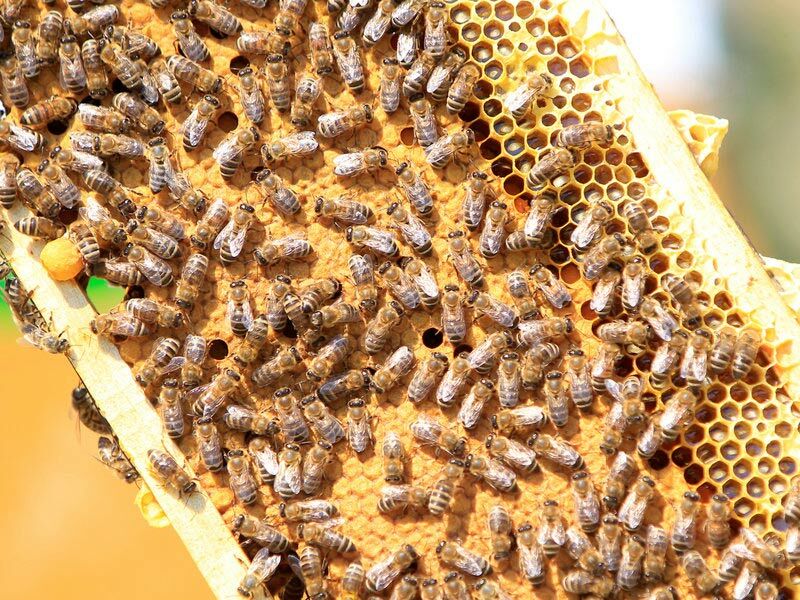 Another plan would call for beekeepers to simply order a queen that's already been vaccinated. While a website has been created for that product, it does not list a price — or say when the vaccine might be available commercially. The new vaccine is still undergoing safety tests, but it could represent a breakthrough in the protection of bees, a crucial link in the food chain. In the U.S., their pollination is vital for many foods we eat, from apples and almonds to watermelons and zucchini. When an American foulbrood infection sets in, each brood cell can host millions upon millions of spores. And because of bees' tidy housekeeping practices, those spores are then spread even further when the bees clean the cell out. The disease can be treated with antibiotics, but no cure is available. "It's a death sentence" for a hive or colony to be diagnosed with the disease, says Toni Burnham, president of the D.C. Beekeepers Alliance in Washington. In D.C. and Maryland, Burnham says, "if a colony is diagnosed with AFB — regardless of the level of the infestation — it burns. Every bit of it burns; the bees are killed and the woodenware burns, and it's gone." Concerns about American foulbrood are so serious, Burnham says, that it's the main reason why her group recommends never buying used bee hives and other equipment. "They have pulled 100-year-old samples out of storage and have been able to reinoculate honeybee hives with American foulbrood spores," she says. In addition to AFB, honeybees and other pollinators face a number of existential threats, from diseases and parasites to insecticides. The researchers in Finland say they plan to use the same approach to combat other diseases. "We hope that we can also develop a vaccination against other infections, such as European foulbrood and fungal diseases," Freitak said in a statement. "We have already started initial tests. The plan is to be able to vaccinate against any microbe." If the vaccine works as the Finnish team expects, it would be a welcome bit of good news for beekeepers, farmers and advocates for pollinators, who have watched one of the world's most important insects struggle in recent decades. "We need to help honeybees, absolutely," Freitak said. "Even improving their life a little would have a big effect on the global scale." While acknowledging the other problems bees face, she added, "If we can help honeybees to be healthier and if we can save even a small part of the bee population with this invention, I think we have done our good deed and saved the world a little bit."